These days you’re almost guaranteed to find new builds with some kind of natural or engineered stone in it. Which one and what kind is really a trend as there are mosaics and different types of stone that are made to look like wood. Of course when it comes to interior design, it’s all about preference. But if you’re a builder or contractor looking to buy a bulk order of natural stone—particularly marble tile, it’s imperative that you not only select a type that will appeal to a mass of buyers, you also want to make sure that you’re getting it at a fair price, especially if you live in Miami where natural stone distributors are found on almost every block! Looking for the cheapest marble tile is not always the best way to go about shopping for marble tile. There are many natural stone distributors that get their inventory from larger ones who are just liquidating their own inventory at a cheaper price. So what this means for the cheaper selling distributors is that they won’t have an ongoing supply of their inventory. It will always change, and chances are you won’t be able to get a replacement if you need it a few years from now. If you’re a homeowner doing a renovation, then that might not be a huge issue. But for developers and contractors, there needs to be an abundant and ongoing supply of whichever selected tile chosen so that they can build their brand with a certain look. Most builders have a certain design that might distinguish them from the competition. They will not be able to achieve that look if each of their building projects is just a hodge-podge of various stone colors. That’s why you want to choose a marble tile wholesale distributor that has access to their own quarry and can handle stocking an abundant supply of their own natural stone tiles. This way when you need to order your bulk supply of marble tile, it will always be readily available to you, and you’ll never have to worry about it running out of stock—that is unless you select a type of marble tile that’s part of a fad, then the supply and demand will kick in and distributors who carry that particular type of marble tile will be forced to no longer stock it. In cases like that you want to look for a wholesale marble tile distributor that has an inventory of timeless natural stone. 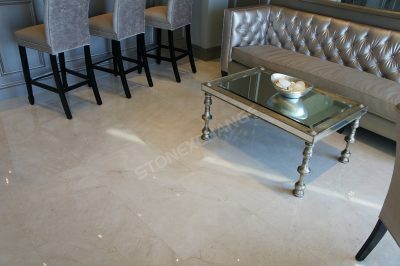 While the new age alternatives like engineered stoned, mosaics, and porcelain tiles have come into play and have become pretty popular, marble is a type of natural stone that will never go out of style and is almost guaranteed to transcend the trends, remaining forever elegant and beautiful—even when it’s not properly kept. The longevity of marble stone has proven itself throughout the ages. From across the seas from the Far East to the old world of Europe, you can see marble in building structures and art that have lasted for centuries. And it still looks attractive. Why wouldn’t you want to incorporate a material like this into your build? Price is definitely a factor, but it doesn’t have to be the end-all for contractors. It’s simply a matter of looking at your budget—short-term and long-term. Sometimes, you will actually save your company more money if you spend more money up front. Many businesses are conditioned to buy low—that means everything from land, property dwellings, to the materials it takes to build. However, that kind of thinking isn’t always the wisest way to go about things—especially in the contracting industry. When you’re in the contracting industry, you need to build dwellings that last and withstand natural disasters like tornadoes, hurricanes, snowstorms, windstorms, etc. When purchasing these materials, you know you can’t afford to go cheap here. Otherwise, it’ll become a huge liability for your business. It is recommended to apply this kind of thinking when purchasing building materials for your interior. Buyers will appreciate that you have taken the initiative to invest in quality materials that may even outlast the actual dwelling—so much, that they’ll often pay top dollar for it. Paying more upfront not only gives you the peace of mind that you’ve installed a solid and luxurious piece of material you can take pride in, it also provides you with a great sales pitch that guarantees potential buyers about their long-standing marble floors. Nalboor Tiles is one of these distributors you want to consider. Located strategically in Miami near a major port, Nalboor Tiles mines marble tiles from their own quarry overseas. Furthermore, the kind of marble tiles that Nalboor keeps in stock are the industry’s most sought after styles. Since Nalboor is an online marble tile distributor, you have the opportunity to order free samples so that you can see and feel exactly what you’re getting before spending a bulk amount of money for your wholesale purchase. Buying wholesale is the only way to go as a building contractor. While you’re spending more money upfront, the unit price is going to be exceptionally low. So looking at your long-term budget, you’ll begin to see the savings over time. Take a look at what Nalboor Tiles has to offer here. The cost per unit already starts off considerably low, but if you’re looking to find the best price, then consider this: the more you buy, the more money you’ll save your company. Although it may not feel like it at the time of purchase, this will in turn increase your revenue. Call Nalboor Tiles today to discuss your discount options or to order a free sample of our products. Our number is 1-305-501-4548, or you can quickly contact us through our online contact form now.